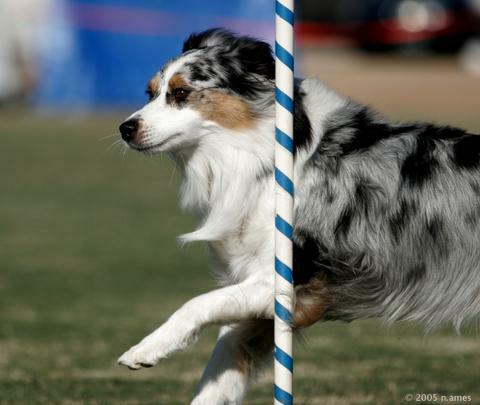 It may surprise you to know that Australian Shepherds don't come from Australia at all! The "Australian Shepherd" was first known in the Basque region of Spain where they were guardians of prized Merino sheep. In the book "All About Aussies" by the Hartnagles, you can see photos from the 1800's of shepherds out in the Southwest U.S. noted as Basques, and sitting next to them are their dogs which you'll instantly recognize as "Aussies." So how did this herding dog from Spain become confused for an Aussie? Sheep are notoriously prone to disease but Merino sheep developed a reputation for hardiness, especially in hot, dry regions where grazing is sparse, such as the Basque. As word spread, demand for them began to grow. Hundreds, possibly even thousands of years ago, the Merinos began to be sold into other regions, and where sheep go, a shepherd and a dog are needed to move them. The dogs and the sheep probably moved first into England, Ireland and Wales. Today in Wales, there's still a breed of dog known as an Old Welsh Bobtail, which looks almost exactly like an "Aussie." During England's colonial era, the Merino started moving outward to parts of the world where other livestock couldn't thrive, such as Australia, South Africa, and New Zealand. Shepherds went where the flocks went and brought their Aussies along with them. When American farmers in the Southwest were looking in the 1800s for stock that could make it in their harsh environment where grazing was too thin and poor for cattle, they looked in other areas with similar climates. The closest was Australia. When they imported the sheep, they brought some herding dogs along with them. That’s how Aussies came to the US and why the breed is so-named. Everyone thought the dogs were native to Australia! Is An Aussie the Right Dog For You? It's advisable for a potential adopter to read and heed these rules. To do otherwise will lead both the dog and the adopter to a fork in the road. You may like the idea of a dog alerting you to visitors, but unless you know how to be a pack leader and exert some control, an Aussie may take it further than you want. Aussies should not be thought of as guard dogs, or encouraged to act like one. Aussies often have a strong prey drive. His agility and lightning speed can make him a formidable match for predator and prey alike. Of course, unless you own a ranch, he would probably be content just to keep rabbits, gophers, and squirrels out of your back yard, but he may also see fast moving bikes or running children as needing his attention. You will need to lay the foundation as packleader for what is off limits. They were bred to be a working dog and therefore they need a job to do or they get bored and invent one – like herding the kids or shredding your socks. Some Aussies are content with a game of fetch, a good run, and a frisbee chase now and then. But many Aussies who end up in rescue are there because their people could not give them enough exercise. or mental stimulation. Be prepared to do some obedience training, agility, flyball, herding, or take them for long stimulating walks. Human companionship is a must. Aussies can kick back while you're at work but they'll want your attention all the rest of the time. We classify Aussies as being more or less Velcro. There are no non-Velcro Aussies. If you just want a dog to cuddle briefly and then go snooze in the corner, an Aussie probably isn't the right dog for you. Aussies have a double coat -- an underlayer of fine down and a top layer of longer, sleeker guard hair. The underlayer thickens and grows as day length shortens in anticipation of colder winter days, and starts to shed when day/night length is equal in late March. You'll hear this referred to as "blowing coat", probably because that's when large tufts of it start blowing around your house and yard! The boys are "in coat" year round because being the male, nature dictates that they always need to look good for the ladies. For you, this means they'll be shedding all year round to some extent. The girls will tend to blow coat in spring, and then be sleek and fairly shed-free. Any dog in poor condition that has an abrupt shift to a better diet will typically blow coat after about three months of the new regimen, and after having pups, Mom dogs will usually blow coat from the hormone shift. Both sexes require regular brushing to keep mats and tangles at bay. A high quality diet, especially one with some meat, will usually help reduce shedding. If you're willing to accept the realities of life with an Aussie, you will be rewarded with years of faithful dedication and active companionship. They are beautiful, sometimes animated, and always intelligent dogs. Easily trained and versatile, they are often found among the ranks of therapy dogs, search and rescue dogs, and guide dogs. Tails: Tails can be naturally bobbed, partial, docked, or full. All are acceptable. (In the EU as of January 2002, tails can no longer be docked.). Weight: girls average 30-55 lbs. "Lethals"- result of merle-to-merle cross, often have hearing or vision issues. Dog appears mainly white. Note: No registry or "papers" guarantee the health, temperament, or suitability of a dog for any specific purpose. There's a lot of support for the idea that Border Collies were bred down from Aussies to be lighter, thriftier dogs able to work smaller livestock like sheep and small dairy cows such as Jerseys and Guernseys using only pressure --their mere physical presence close to the animals. Aussies can work using light pressure, say with ducks, up to heavy stock like cattle, mules, and horses, and even bison, that may have to be physically intimidated. If stock doesn't respond to pressure, the dogs blow up their ruffs, bark, dodge at the stock's legs and rumps and grip them (a inhibited bite which pinches but doesn't break skin), and as a last resort, they'll body check the stock with a move called the “Aussie slam”. But a dog should only use the minimum force needed. Useless running and barking gets stock upset and runs off weight and increases the chance of injury. 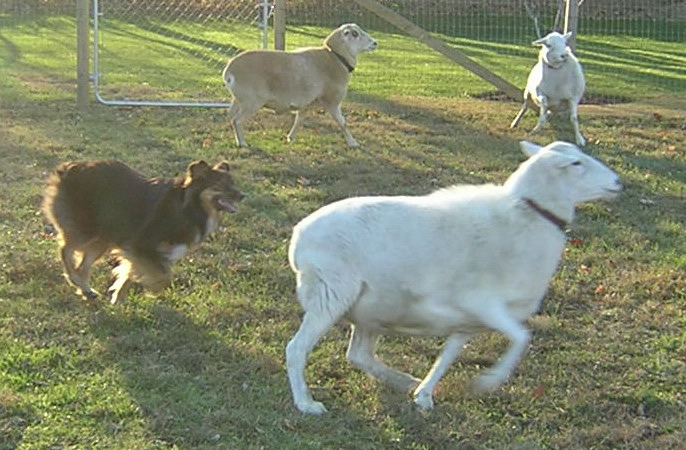 The best herding dogs are the least flashy to the untrained eye. There's also a theory that the Bernese Mountain dog originated from a cross between the basic black tri Basque herding dog and the large Roman war dogs, introduced when the Romans expanded into Spain. Looking at a well bred working type black tri and a Berner, it seems obvious there's a relationship.